The Subaru Legacy occupies the sparsely populated space between high-value family sedans and premium sports sedans, offering some of the best characteristics of both. Great gas mileage and a smooth ride. 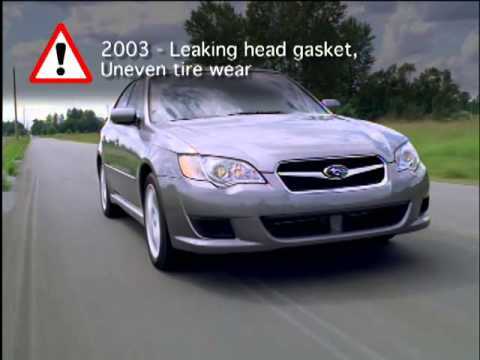 The 2008 Subaru Legacy 2.5i Sedan is an extremely comfortable and quiet ride. It's a bit longer and wider than the Impreza. The extra length and width give the Legacy a leg up in safety. My particular model features a sun roof which is very nice one a pleasant day. It also has a sport shift feature (it's an automatic with the ability to be driven like a manual). The standard for this model is about 27 miles per gallon on the highway and 23 city but I typically get around 28 or 29 highway. The only problem I run into is the heat shield loosening which happens in climates with snow. Great mileage, horsepower, and handling. This car is very reliable. It gets great mileage in the city and on the highway. The Subaru has great handling with low profile tires. The car has excellent performance in terms of horse power. It may be a little small in terms of tall or large people entering and when exiting. It is very low to the ground. One other thing is the small seats in the front driver seat and front passenger seat. Rear seats seem to have more room. Good, inexpensive car for a beginner driver. I really love it. The only real problem was the tires, since they make potholes impossible. I had to spend over a thousand dollars after the potholes took out two of my tires. So I bought better tires on it, and the thickness of the new tires really helped. The trunk is a good size and the seats are nice and roomy. The sound system is not the best, but that is alright since it is a relatively inexpensive car. 2008 Subaru Legacy. Start Up, Engine, and In Depth Tour. SUBARU IS RECALLING 16,715 MY 2007-2008 LEGACY SEDAN AND WAGON, MY 2008 IMPREZA SEDAN AND WAGON, AND MY 2009 FORESTER VEHICLES. SOME VEHICLES MAY HAVE THE CYLINDER HEAD-SIDE OIL SUPPLY PIPE AND TURBOCHARGER-SIDE PIPE IMPROPERLY ASSEMBLED. VIBRATION WOULD OCCUR WHILE DRIVING, AND OVER TIME COULD EVENTUALLY RESULT IN CRACKING THE PIPE, WHICH WOULD ALLOW OIL TO LEAK. IF LEAKING OIL CONTACTS COMPONENTS OPERATING AT HIGH TEMPERATURES, AN ENGINE COMPARTMENT FIRE COULD OCCUR. DEALERS WILL INSPECT FOR CRACKING OR AN OIL LEAK AT THE OIL SUPPLY PIPE AT THE CYLINDER HEAD-SIDE. AN ADDITIONAL BRACKET WILL BE INSTALLED TO INCREASE RIGIDITY OF THE PIPE AND THE PIPE ASSEMBLY WILL BE REPLACED WITH A MODIFIED PART. THE RECALL IS EXPECTED TO BEGIN DURING NOVEMBER 2008. OWNERS MAY CONTACT SUBARU AT 1-800-782-2783.